WELCOME TO MUM'S GUIDE TO ROMFORD! From bumps to teens, we have it covered! This is your one-stop site for everything you need to know about living in Romford with children including children's activities, things to do and other local services such as health, education and party providers & supplies! 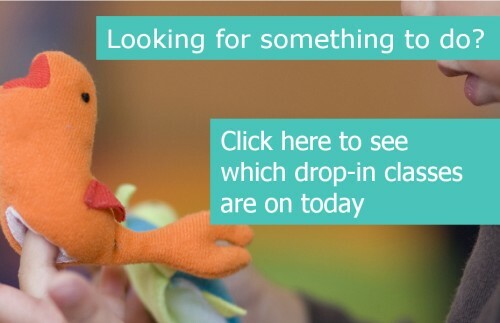 Whether you have lived in Romford for years or are new to the area, this website will help connect you with great activities for you and your children, help you to discover what's going on in your area and hopefully help to keep the kids busy and entertained. It will also direct you to details of local medical centres, libraries, Children's Centres, fitness clubs, nurseries and schools - and so much more. Follow us on Facebook, Twitter and Instagram as that's another great way to keep up to date with what's happening locally. In the meantime, if you run a local business or event that's relevant to children and families I'd love to hear from you and get you listed on the site. NEW - you can now add RECOMMENDATIONS for your favourite businesses! Use our category menu or the search bar to find the listing you want to recommend and click the "Add recommendation" button. You'll be asked to register the first time and then you can add recommendations for as many businesses as you like. SEND & Siblings at Teatots! 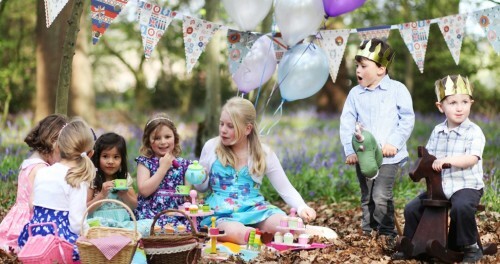 There are so many activities and events scheduled for the Easter holidays that we thought we would give you our Best Picks! 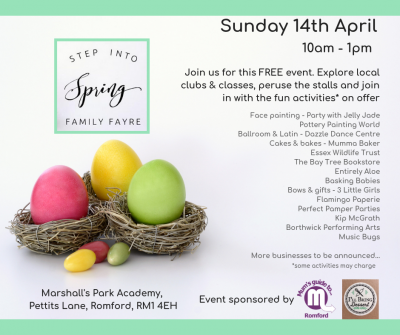 Step Into Spring Family Fayre on Sunday 14th April. 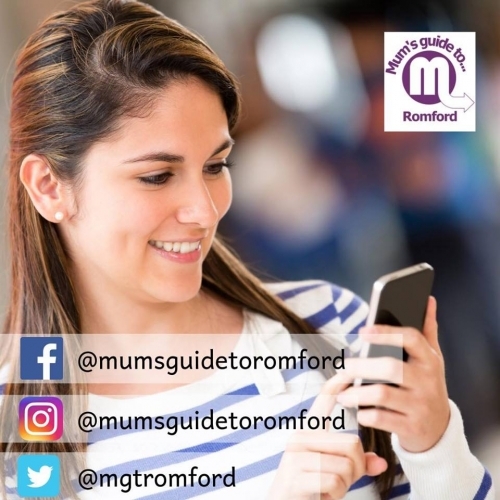 Mum's guide to Romford are actually sponsoring this event and we are so excited to be sharing some amazing businesses with you. There are FREE activities for children to join in with along with some other activities which will have small charges. There will be a slime station, glitter faces, a photo shoot, face painting, delicious cakes and some fantastic stalls selling terrific products for you and your children. Easter at Hopefield from 11th to 26th April. Hopefield Animal Sanctuary is a great charity to support and they have lots of activities running over the holiday period - not to mention all the lovely animals that children can see. Bedfords Park - Over the 2 week break there are so many different activities happening at Bedfords Park. Children can join in with den building, bird trail, pixies & elves event, pond dipping and so much more. Most activities need to be pre booked as spaces are limited. Ingrebourne Visitors Centre in Hornchurch Country Park have also got a lot of different activities planned. 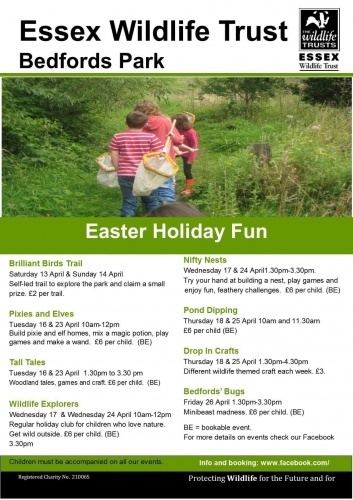 Children can make butterfly feeders, bottle rockets, try archery, make Easter bonnets, create sand art, try den building, pond dipping, complete a teddy bear trail and lots lots more! Most activities need to be pre booked as spaces are limited. Smart Eggs at The Mercury Mall from 11th April to 28th April. This is a great opportunity to keep the kids occupied while you get some shopping done! Pop to the information desk on level 2 to find out more. Spring Wildlife Trail at Belhus Woods from 5th April to 22nd April. These self laid trails are great because they can be done at your leisure and there is time to stop and play at the amazing play area at Belhus while you are there, or for a picnic if the weather is good! We will be trying this one ourselves! Easter on Romford Market is set to be a great day out for all the family. There will be lots of completely FREE activities happening throughout the day including face painting, fairground rides, appearances from Peter Rabbit and an Easter Egg Trail. So much to see and do! Spring Babies at Wellgate Community Farm Saturday 27th - 28th April. Come along and support this great community farm and enjoy some of the fun. There will be stalls, sideshows and animal encounters where you can meet some of the farm's residents. There will also be a spring trail, crafts, bouncy castle, pony & cart rides and refreshments with a BBQ. Inflatable Family Fun Days at Harrow Lodge Park and Raphael Park. There will be bouncy castles, assault courses, inflatable games and soft play for under 5s. Wristbands are £7. At Raphael Park every Tuesday & Friday over the holidays. At Harrow Lodge Park every Monday & Wednesday. Easter Monday Running Day at Havering Miniature Railway Join the fun on Easter Monday 22nd April at Lodge Farm Park. This is always popular so its wise to get there early to avoid the queues. The trains will be running from 11am. Under 3s travel for free with an adult and all other fares are £2. For more ideas check out our 'What's On' guide and follow our Facebook and Instagram pages for daily updates and highlights! There's Something Spooky Going On! Have you got a Blue Peter Badge? Secondary School Applications - Are You Ready? Eating Out With The Kids - The Offers!